Have you just welcomed a new member to your family? Then you no doubt are feeling the responsibility to do your best to protect them. One concern will be chemicals vs cleanliness in the house. Fear not! Here are some top cleaning tips for new parents from Main Cleaners SW17. Being a parent can be an extremely rewarding experience, yet, you will soon discover the number of responsibilities you need to face has significantly increased. One such responsibility is maintaining your home in a pristine condition as the little one’s immune system is much more susceptible to bacteria and allergens. There’s no need to be scared, however. All you have to do is follow the list of game-changing cleaning tips for new parents, we have compiled for you! Having a baby in your home means you will have to change some of your habits. Changes should be made in your cleaning routine as well. It’s highly recommended to steer clear of using toxic detergents, so you might need to toss out your old cleaning kit! Opt for natural products such as white vinegar, Castille soap, baking soda, and lemon juice. These all-natural products are just as efficient in removing a wide range of stains and soils from your carpeting and work surfaces, but are safer for you and the latest addition to your family. You can get any cleaning job done with a home-made detergent and a few microfibre cloths. Fresh air is good not only for your baby’s health but for you and your significant other. And the best part is it won’t cost you anything. All you have to do is air your rooms for half an hour each day. What’s more, you don’t need expensive room deodorisers to chase away the unpleasant odours in your home – you can mix up your own home-made deodoriser. Simply fill a small cup or jam jar with baking soda and place it in a strategic position in the room. You can twine a ribbon around it to make it look like a part of your décor. 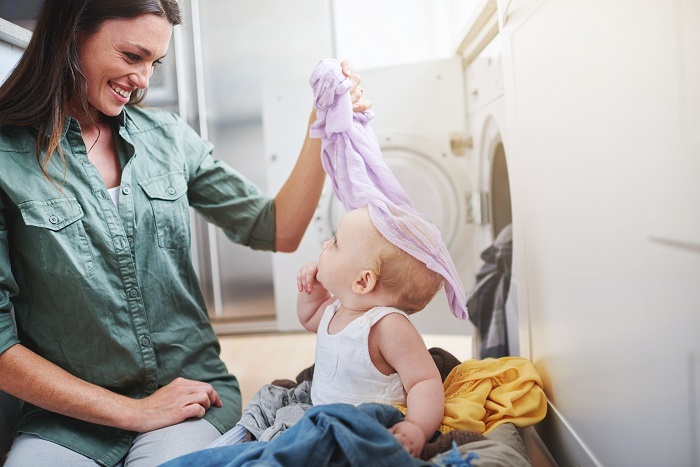 If you are concerned about using bleach or other chemicals to remove stubborn stains from your laundry then there is no need to despair – there is a natural way to get rid of nasty soils that is totally safe for your newborn. Once you’ve done your laundry (try out natural laundry detergents without any fragrances), simply hang the laundry on your clothesline and leave it to dry in the sun. You’ll soon find out sunshine is the best stain remover and will never again resort to using bleach. Besides, as strange as it may sound, sunlight can eradicate germs, too! Fruit flies are very annoying and can multiply at a very rapid pace. You hardly want them around your baby, correct? Thankfully, there is a very simple, natural and budget-friendly way to rid your home of these annoying little creatures. All you will need is liquid dish soap and a bottle of vinegar, preferably the apple cider variety. Pour equal parts of vinegar and soap in a small bowl or a mason jar and place it somewhere near your bowl of fruits. The vinegar will attract the little flies and they will attempt to land in the bowl. Thus, the unfortunate flies will soon be trapped in the soap and drowned. If it’s cold in the winter and you can’t open the window as frequently, try adding a few pot plants to your nursery. Plants improve the quality of indoor air; certain species are said to clean up to ninety percent of the toxins in the air in less than a day. Some of the best options include aloe vera and spider plants, as these are easy to grow and maintain. See, we told you there was nothing to be scared of. Give these cleaning tips for new parents a try and you’ll render your living space clean and safe enough for your baby. This way, you will be able to enjoy the excitement of being a parent for the very first time instead of constantly worrying over germs and stains. For more ideas or help with your cleaning needs, check out Main Cleaners SW17.